...courtesy of the wind, for our New Moon in Aquarius altar and for a foot bath that will promote leg circulation. I am "that" person on campus, hands full of plant life and I'm also wearing an herb patterned blouse and leaf earrings. Always makes for great conversation! A few days ago I made a pine needle and bark decoction for a foot bath that promotes blood circulation in the legs. 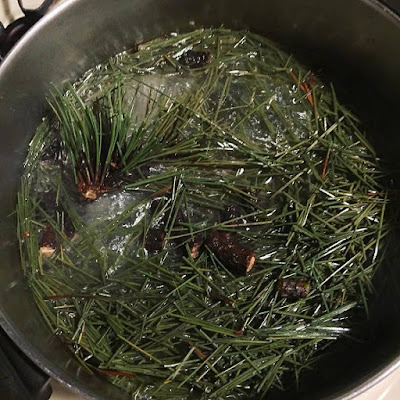 I boiled the pine needles and bark (from a fallen branch) in water, after chopping them up a bit, for 10 minutes and then I let the pot of pine simmer for about 15 minutes. You'll start to see oils floating on the surface you may not want to use a pot you love as it might get some resin on it, it's easy to scrub off though. I let the decoction cool just a bit and then added it to an equal amount of cool water. I added essential oils of spruce and rosemary to boost circulation and I can't recommend this practice enough, especially if you have a desk job or travel a lot for work. Practicing this kind of self care can prevent such things as deep vein thrombosis. My left leg suffers from minor inflammation from time to time due to stagnation and this foot bath eliminated my inflammation and dullness in my leg within 5 minutes. Oh, I also rubbed on some of my Rosemary and Piñon Body oil onto my feet before submerging them, which I only have a few left of in my etsy shop. And on a side note, a Pine Tree grounding meditation. This was my meditation view before picking up a fallen branch for our new moon altar and my foot bath. I sunk and grounded downwards like the roots beneath my being with my head and back against the pine's trunk, breathing into my belly and letting the mind clutter clear. The is what folks call a grounding meditation. Simple practices like this can really support connection to nature and can lay a good foundation for healing. Try envisioning roots growing from yourself into the earth like the tree you are sitting next to. A message from the Pine Tree as I departed and made my way back to my office space. Cut me and I will continue to grow, as a matter of fact, I will flourish. Persecute me and I will continue to practice my rituals with an ever increasing faith. I am nature, I am fluid, I am constant, I am you and you are me.